How hard are they to keep? We would class this as a moderate care level. What is its maximum size? 2.5cm Where are they from? They originate from Burma (Now Myanmar). 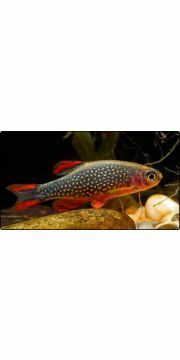 First introduced to the hobby in late 2006, described as a rasbora and still holds that name but it is a danio. Also known as ‘Fireworks Danio’. How many can I keep? They will do best in groups of 6 or more. What are the ideal water conditions? Ideal water conditions are a temperature range of 20-25c. PH 7-7.5. What do you feed them? They will eat a variety of foods. Feed a varied diet of frozen, freeze dried and flake foods. How compatible is it with other fish? These beautiful brightly coloured fish make ideal peaceful tank mates for the peaceful community tank of small fish and shrimps. How do you breed them? 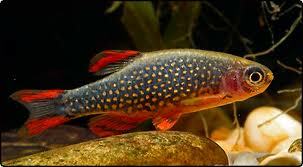 Males are more colourful and have a deeper blue colour and more red on the fins. they are an egg scatterer, they will spawn about 30 eggs on fine leaved plants. Remove the adults after spawning as they will eat the eggs. Fry will hatch out after 3-6 days, feed on infusoria.